Count one number at a time! Say them nice and loud! Which ones do you trace? Even or odd? Only the odd ones. Great for identifying odd numbers. 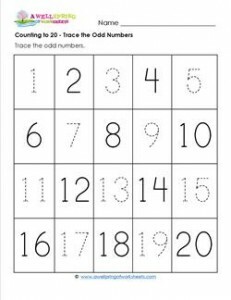 Please go to this page to see all the counting to 20 worksheets in this set.